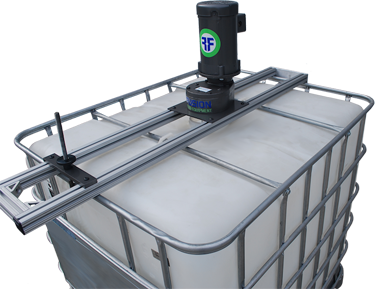 Fusion tote mixers are designed for quick setup and enhanced portability while providing uniform tote mixing. Standard and custom designs are available to meet your needs. Fusion's tote mixers are versatile, lightweight, stable, and provide uniform mixing. Bridge Mount tote mixers offer a very robust platform for aggressive mixing. These attach across the top rails of cage style totes that are up to 52" wide, and can quickly and easily be moved from tote to tote. Cap Mount Tote mixers mount directly to a Schutz style 6" screw cap. A tie rod mounting kit is included to provide additional stability. Complete line of gearboxes and accessories provides a wide range of mixing speeds to suit your needs. Single or dual 316L stainless steel folding impellers or marine impellers are located on a 316L stainless steel shaft. All stainless steel versions and other impeller styles are also available. Custom tote mixers can be designed and built to your application's specification.